The Clinical Pharmacology Analytical Core (CPAC) is available to assist Indiana University Melvin and Bren Simon Cancer Center (IUSCC) investigators as well as external partners with pre-clinical and clinical pharmacokinetics in support of their research projects and scientific goals. Established in 2004 in response to a growing need for pharmacokinetic analysis and modelling, the Clinical Pharmacology Analytical Core (CPAC) assists investigators by providing detailed information on drug interactions, quantification of drugs, metabolites, and protein binding of small molecules. In addition, CPAC offers preliminary determination of drug metabolism which includes metabolite identification and metabolic stability. The process of rational drug design should be based upon a strong foundation of biology, chemistry, in vivo pharmacology, and pharmacokinetics. Relevant pharmacokinetic and metabolism studies should be conducted in small animal models or in vitro systems before first drug administration in humans. This allows for the iterative process of implementing structural changes in the drug molecule to optimize the activity of the drug and its pharmacological and pharmacokinetic properties prior to moving to the more regulated and expensive clinical phase of drug development. For these reasons, CPAC interacts closely with the In Vivo Therapeutics (IVT) Core to coordinate these efforts. Over the past years, the CPAC and IVTC have worked together to generate data allowing PIs to better evaluate molecules being developed within the IUSCC that show promise as novel cancer drugs. 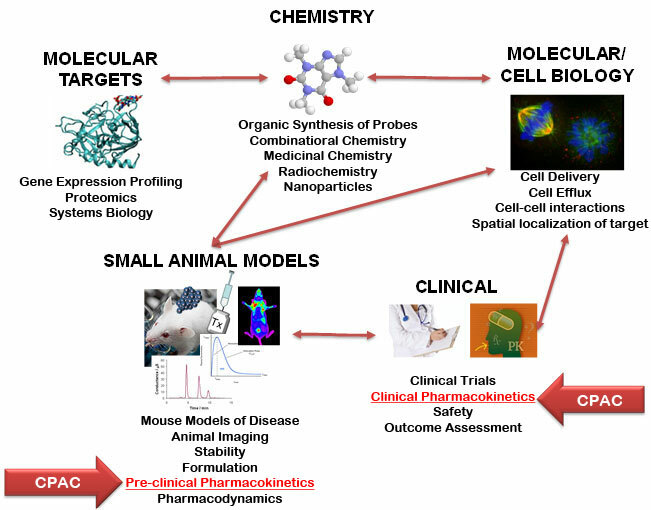 Pharmacokinetic and metabolism data provide important information to guide drug design and treatment in pre-clinical drug discovery (bench) as well as in clinical drug development and treatment (bedside). Using state-of-the-art technology and expertise, CPAC supports the research and development of safe and more efficacious drug treatment for IUSCC investigators.